If the Rangers were a political party trying to determine their candidate for a presidential race based off September production, there would be a whole lot of votes being taken from one another. Down the stretch, the Rangers' big-money guys have played up to their paper, as they're currently 17-10 in their 27 games this month and have, in the process, taken over first place in the jam-packed AL West — something we never thought we'd see a couple of months ago. It all has to start with perhaps the most unlikely contributor in the form of Shin-Soo Choo, who was so awful for the first three months of the season but has turned into the player the Rangers thought they were getting all along since the all-star break when they gave him $130 million. 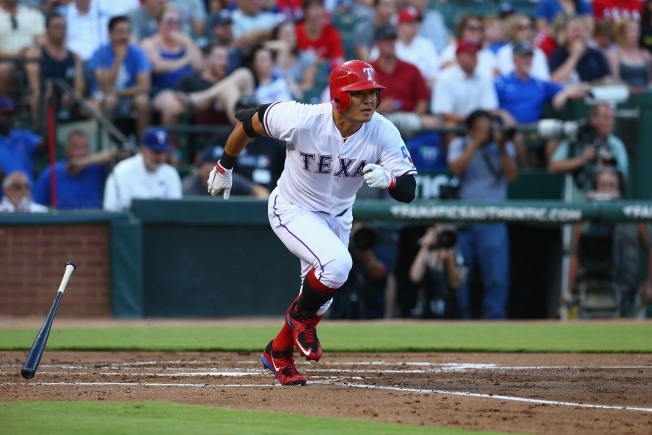 In his 27 games this month, Choo is batting a ridiculous .410 with a .524 on-base percentage and 1.164 OPS. He has six doubles, a triple and five homers to go with his 20 RBIs and has more walks (20) than strikeouts (19). Oh, and there's been just one game this month when Choo hasn't reached base at least once. He's simply been phenomenal. There's a very good chance Choo will be the AL Player of the Month for September, and that's a crazy thought considering where he was just a couple of months ago. If it's not Choo, the Rangers have a couple of other prime candidates in Adrian Beltre and Prince Fielder. Beltre has one RBI for each game he's played his month (27) and is hitting .321 with a .382 on-base percentage this month. Fielder's average is lower, as his season total has dipped down near .300. He's batting just .269 but has his on-base percentage up to .387 for the month to go with three doubles, six long balls and 24 RBIs. Those three have carried the Rangers' offense this month, and that's just the way Jon Daniels drew it up. Now, if they can just continue this for a little bit longer.